Generalizing concepts from linear (matrix) algebra, we define the mode-n identity tensor and the mode-n pseudo-inverse tensor and we employ them to develop a multilinear projection algorithm in order to performing recognition in the tensor algebraic framework. Multilinear projection simultaneously projects an unlabeled test image into multiple constituent mode spaces, associated with image formation, in order to infer the mode labels. 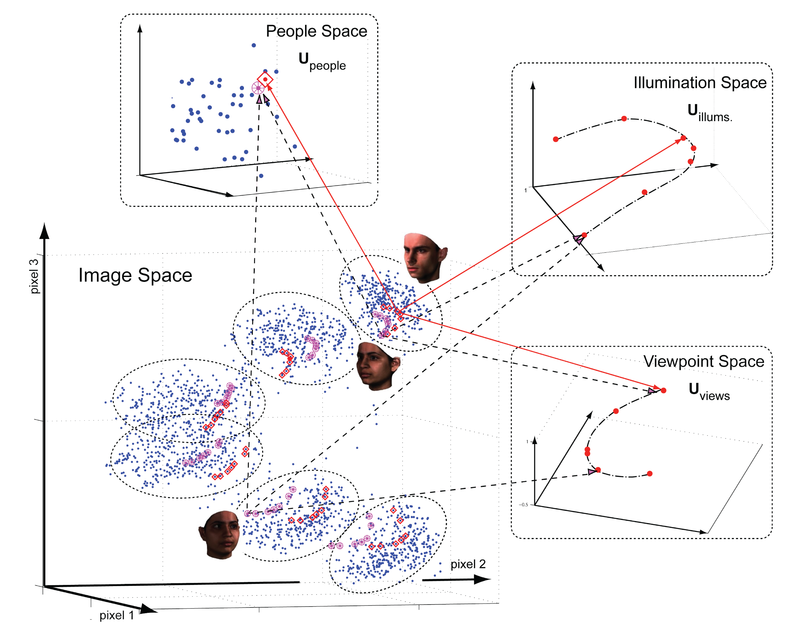 Multilinear projection is applied to unconstrained facial image recognition, where the mode labels are person identity, viewpoint, illumination, etc. "Multilinear Projection for Face Recognition via Canonical Decomposition ", M.A.O. Vasilescu, In Proc. Face and Gesture Conf. (FG'11), 476-483. "Multilinear Projection for Face Recognition via Rank-1 Analysis ", M.A.O. Vasilescu, CVPR, IEEE Computer Society and IEEE Biometrics Council Workshop on Biometrics, June 18, 2010. "Multilinear Projection for Appearance-Based Recognition in the Tensor Framework", M.A.O. Vasilescu and D. Terzopoulos, Proc. Eleventh IEEE International Conf. on Computer Vision (ICCV'07), Rio de Janeiro, Brazil, October, 2007, 1-8. “Multilinear Independent Components Analysis and Multilinear Projection Operator for Face Recognition”, M.A.O. Vasilescu, D. Terzopoulos, in Workshop on Tensor Decompositions and Applications, CIRM, Luminy, Marseille, France, August 2005. Independent Component Analysis (ICA) minimizes the statistical dependence of the representational components of a training image ensemble, but it cannot distinguish between the different factors related to scene structure, illumination and imaging, which are inherent to image formation. We introduce a nonlinear, multifactor model that generalizes ICA. A Multilinear ICA (MICA) model of image ensembles learns the statistically independent components of multiple factors. Whereas ICA employs linear (matrix) algebra, MICA exploits multilinear (tensor) algebra. In the context of facial image ensembles, we demonstrate that the statistical regularities learned by MICA capture information that improves automatic face recognition. "TensorTextures: Multilinear Image-Based Rendering", M. A. O. Vasilescu and D. Terzopoulos, Proc. ACM SIGGRAPH 2004 Conference Los Angeles, CA, August, 2004, in Computer Graphics Proceedings, Annual Conference Series, 2004, 336-342. "TensorTextures", M. A. O. Vasilescu and D. Terzopoulos, Sketches and Applications SIGGRAPH 2003 San Diego, CA, July, 2003. The goal of machine vision is automated image understanding and object recognition by a computer. Recent events have redoubled interest in biometrics and the application of computer vision technologies to non-obtrusive identification, surveillance, tracking, etc. Face recognition is a difficult problem for computers. This is due largely to the fact that images are the composite consequence of multiple factors relating to scene structure (i.e., the location and shapes of visible objects), illumination (i.e., the location and types of light sources), and imaging (i.e., viewpoint, viewing direction and camera characteristics). Multiple factors can confuse and mislead an automated recognition system. In addressing this problem, we take advantage of the assets of multilinear algebra, the algebra of higher-order tensors, to obtain a parsimonious representation that separates the various constituent factors. 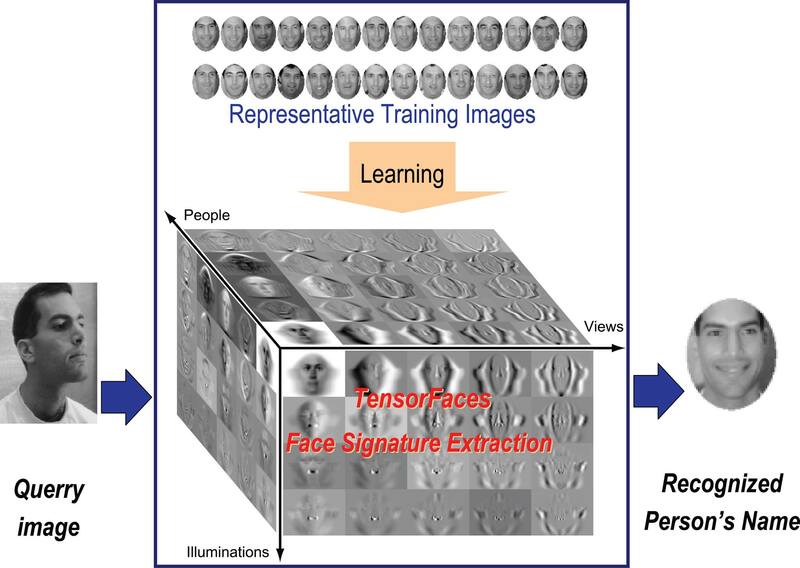 Our new representation of facial images, called TensorFaces, leads to improved recognition algorithms for use in the aforementioned applications. "Tensor subspace Analysis for Viewpoint Recognition", T. Ivanov, L. Mathies, M.A.O. Vasilescu, ICCV, 2nd IEEE International Workshop on Subspace Methods, September, 2009. "Multilinear Subspace Analysis for Image Ensembles,'' M. A. O. Vasilescu, D. Terzopoulos, Proc. Computer Vision and Pattern Recognition Conf. (CVPR '03), Vol.2, Madison, WI, June, 2003, 93-99. "Multilinear Image Analysis for Facial Recognition,'' M. A. O. Vasilescu, D. Terzopoulos, Proceedings of International Conference on Pattern Recognition (ICPR 2002), Vol. 2, Quebec City, Canada, Aug, 2002, 511-514. "Multilinear Analysis of Image Ensembles: TensorFaces," M. A. O. Vasilescu, D. Terzopoulos, Proc. 7th European Conference on Computer Vision (ECCV'02), Copenhagen, Denmark, May, 2002, in Computer Vision -- ECCV 2002, Lecture Notes in Computer Science, Vol. 2350, A. Heyden et al. (Eds. ), Springer-Verlag, Berlin, 2002, 447-460. 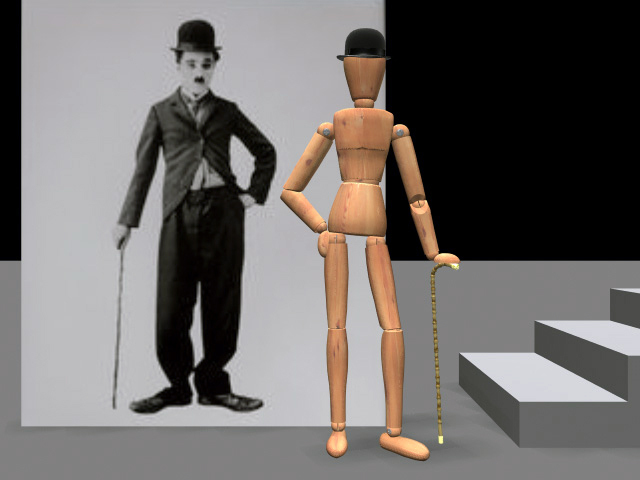 Given motion capture samples of Charlie Chaplin's walk, is it possible to sysignatures, do people have characteristic motion signatures that individualize their movements? If so, can these signatures be extracted from example motions? Furthermore, can extracted signatures be used to recognize, say, a particular individual's walk subsequent to observing examples of other movements produced by this individual? We have developed an algorithm that extracts motion signatures and uses them in the animation of graphical characters. The mathematical basis of our algorithm is a statistical numerical technique known as n-mode analysis. For example, given a corpus of walking, stair ascending, and stair descending motion data collected over a group of subjects, plus a sample walking motion for a new subject, our algorithm can synthesize never before seen ascending and descending motions in the distinctive style of this new individual. "An Algorithm for Extracting Human Motion Signatures", M. A. O. Vasilescu, Computer Vision and Pattern Recognition CVPR 2001 Technical Sketches, Lihue, HI, December, 2001. "Human Motion Signatures for Character Animations", M. A. O. Vasilescu, Sketch and Applications SIGGRAPH 2001 Los Angeles, CA, August, 2001. "Recognition Action Events from Multiple View Points," Tanveer Sayed-Mahmood, Alex Vasilescu, Saratendu Sethi, in IEEE Workshop on Detection and Recognition of Events in Video, International Conference on Computer Vision (ICCV 2001), Vancuver , Canada, July 8, 2001, 64-72. 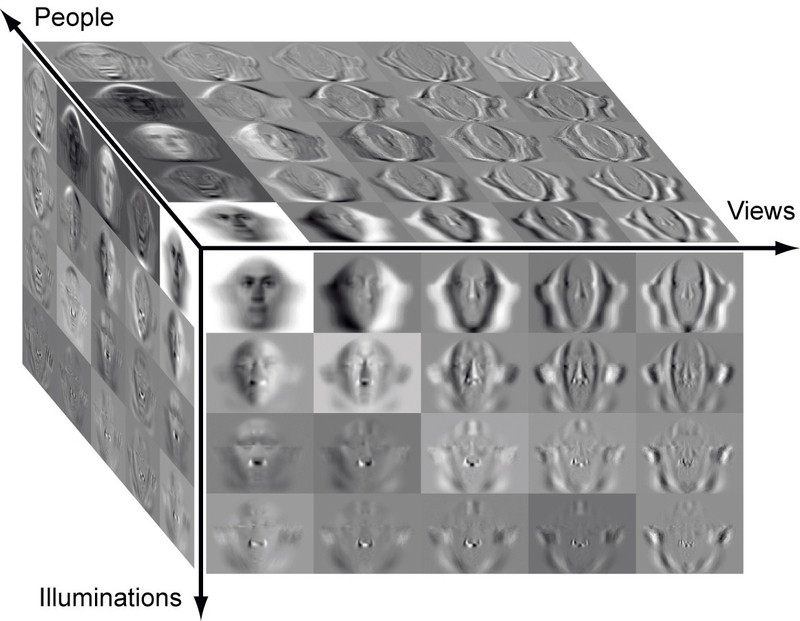 Adaptive mesh models for the nonuniform sampling and reconstruction of visual data. Adaptive meshes are dynamic models assembled from nodal masses connected by adjustable springs. Acting as mobile sampling sites, the nodes observe interesting properties of the input data, such as intensities, depths, gradients, and curvatures. The springs automatically adjust their stiffnesses based on the locally sampled information in order to concentrate nodes near rapid variations in the input data. The representational power of an adaptive mesh is enhanced by its ability to optimally distribute the available degrees of freedom of the reconstructed model in accordance with the local complexity of the data. We developed open adaptive mesh and closed adaptive shell surfaces based on triangular or rectangular elements. 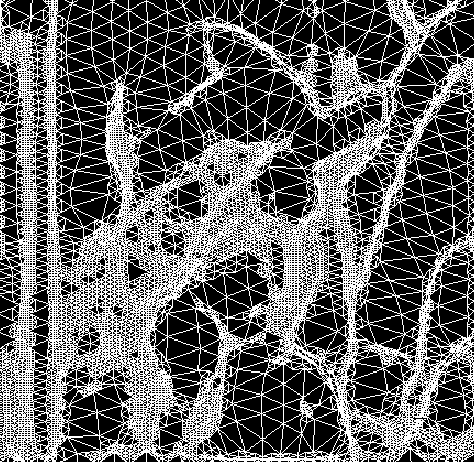 We propose techniques for hierarchically subdividing polygonal elements in adaptive meshes and shells. We also devise a discontinuity detection and preservation algorithm suitable for the model. Finally, motivated by (nonlinear, continuous dynamics, discrete observation) Kalman filtering theory, we generalize our model to the dynamic recursive estimation of nonrigidly moving surfaces. "Adaptive meshes and shells: Irregular triangulation, discontinuities, and hierarchical subdivision," M. Vasilescu, D. Terzopoulos, in Proc. Computer Vision and Pattern Recognition Conf. (CVPR '92), Champaign , IL, June, 1992, pages 829 - 832. "Sampling and Reconstruction with Adaptive Meshes," D. Terzopoulos, M. Vasilescu, in Proc. Computer Vision and Pattern Recognition Conf. (CVPR '91), Lahaina, HI, June, 1991, pages 70 - 75.